In December 1934 talks were held by the development group of the RLM (LC II) in the presence of State Secretary Milch which were to lead to important decisions concerning future air armaments. The following is noted in the minutes under Section 4 "Rotary Wing Aircraft": "The development of rotary wing aircraft is to receive preferential treatment. Consequently all work now under way is to be accelerated, as these aircraft will presumably be of significance for land and sea use in the future." In the LC II.1’s general working plan (Dec. 1935) "rotary wing aircraft" appeared under the heading: "Sport, basic training, advanced training and special aircraft" (Report II/1a). The following types are listed: Fi 184, Fw 61, Focke Wulf project (the later Fw 186) and LC 30 Focke-Wulf license. Focke-Achgelis became licensed by Cierva to manufacture his patented components. For a number of years before the outbreak of World War II, Focke-Achgelis produced the C-19 Autogyro, and they drew heavily from the knowledge and experience gained from Cierva's design to rapidly advance the development of their FA-61 helicopter. 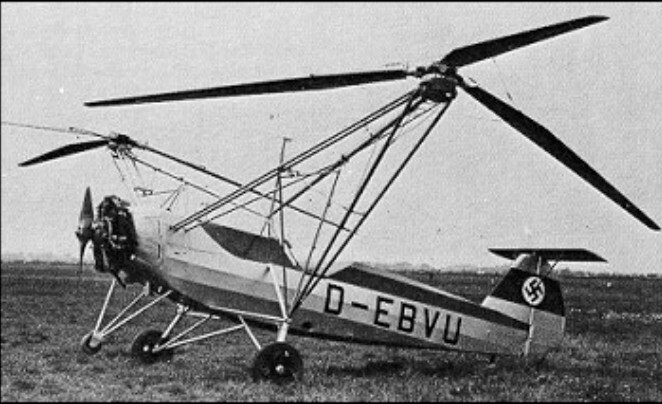 On 26 June 1936, Ger-many's first successful helicopter flew, lasting 28 seconds, with test pilot Ewald Rohlfs at the controls. Pro-fessor Heinrich Focke's Fa 61 was a true helicopter. 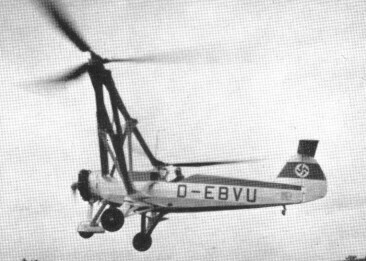 Registered D-EBVU, the Fw 61V1 utilised a nose--mounted 160-hp Siemens engine drinv two outrigger-mounted fully-articulated three-blade rotors via gears and torque shafts; the propeller was merely for cooling. The twin rotor blade angle could be increased or decreased so as to provide lateral movement of the aeroplane by creating a lift differential between one side and the other. Having been adapted from a Focke-Wulf Stieglitz trainer, the Fa 61 none the less proved more tract-able than any previous vertical-lift aircraft. On 25 June 1935, test pilot Edwald Roffifs set altitude and duration records of 2440 m (8002 ft) and 80 minutes 49 seconds. Next day he flew at 123 kph (76.15 mph) over 20 km (12.4 miles) and set a closed-circuit record of 80 km (49.7 miles). In May 1937 the Fw 61 made its first landing using autorotation, and in February 1938 the aircraft's controllability was convincingly demonstrated by Germany's celebrated aviatrix Hanna Reitsch flew the helicopter inside Berlin's Deutschlandhalle at the 1938 German Motor Show. On 14 successive evenings Flugkapitdn Hanna Reitsch demonstrated the machine in front of audi-ences of 20,000 people, including some interested foreign military attaches. 25/26 June 1937 (pilot Ewald Rohlfs): 2439m altitude; 1 hr. 20 min. 49 sec. endurance; 80.604km distance in a straight line; 122.553km distance over a closed circuit; 16.40km/h speed over a closed circuit. 25 October 1937 (pilot Hanna Reitsch): 108.974km distance in a straight line between Bremen and Berlin. 20 June 1938 (pilot Karl Bode): 230.348km distance in a straight line. 29January 1939 (pilot Karl Bode): 3427 m (11,243 ft) altitude. This model could reach a 122 km/h speed.